Meet Bart, the award winning three legged AKC champion! 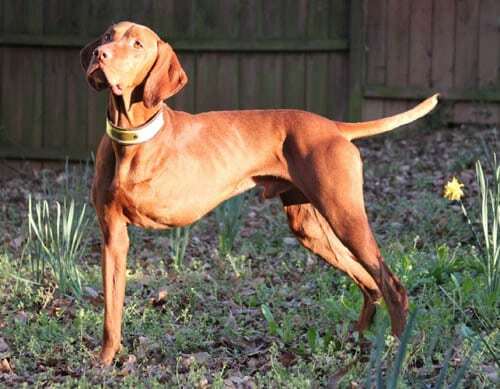 Tune in to hear Darcy Duval, pawrent to Bart, a 3-year osteosarcoma survivor and world-famous show champion and master hunting dog who was the first Vizsla in history to have accomplished this title (start to finish) on 3 legs. Along with Bart we’ll meet his long-time veterinarian, Dr. Abby Huggins, DVM, from Terrell Mill Animal Hospital in Marietta, Georgia, who discovered Bart’s osteosarcoma in June, 2008. Dr. Huggins has worked with Bart since he was two months old. She graduated from Duke University in 1997 with a BS in marine biology and received her DVM from the Ohio State University in 2001, where she was inducted into Phi Zeta, the national verterinary honors society. Dr. Huggin’s veterinary interests include soft tissue surgery, ophthalmology, and doing her part in promoting the human-animal bond. In 2008, three year-old Bart was going along his daily life practicing for field trials, hunting and running up to 16 miles with his Mom Darcy. After a persistent limp wouldn’t go away with R&R, Darcy took Bart to Dr. Huggins, his regular vet, who gave them the sad news that Bart had osteosarcoma growing in his scapula. With Dr. Huggins’ guidance and supportive information she found on Tripawds, Darcy proceeded with amputation, chemotherapy and consulted with a holistic veterinarian to put Bart on the best diets and supplements pawsible. After two years, Bart was weaned off all of the above supplements because he was now a healthy dog in remission! Bart continues to eat grain free kibble with anti-oxidants and raw meat. He also gets Fish Oil from Omega QD. Three years later, Bart is still in remission! Nothing slows Bart down and his accomplishments are many. See this PDF detailing Bart’s canine cancer treatment for more information. In October 2008, only three weeks after finishing chemo, Bart finished his AKC Senior Hunter Title and in April, 2009 earned his AKC Master Hunter Title, the highest title an AKC dog can receive. 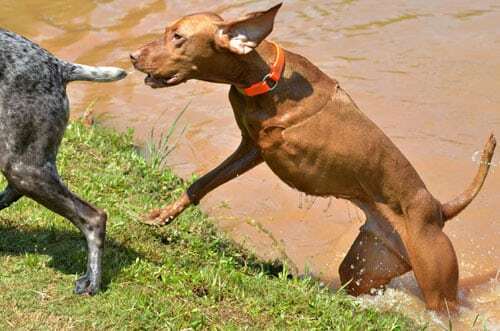 Bart continues to train for field trials, duck work in water, therapy work such as meeting Wounded Warriors veterans and continuing to receive recognition by organizations such as the Vizsla Club of America and the American College of Veterinary Internal Medicine Foundation. Post questions for Darcy and Dr. Huggins with a reply to this topic, or join us in the Tripawds Live Chat during the show! DISCLAIMER: Information provided is for entertainment only and is not a substitute for professional veterinary advice. *Tune in to join our discussion with Darcy and Bart’s vet or join us in the Tripawds Chat room during the show! You do not need to call to hear the show. Listen live to all Tripawds shows on BlogTalkRadio or check this topic after the show for the program podcast. Wow, Bart is one amazing pup! I'm looking forward to tuning in…. Tune in today at 3:30pm PDT (6:30 Eatsern) to learn all about 3-year osteosarcoma survivor Bart! You do not need to call to hear the show. Listen live online here, or call 310-388-9739 with your questions. Stay tued to this topic for the podcast. Many thanks to Darcy and Dr. Huggins for a fun informative program! Listen to the audio stream below or click the iTunes button to download the podcast and hear it offline. Visit this program's Tripawd Talk Radio page for a slide show of photos while you listen. The importance of a healthy grain-free diet! Importance of keeping Tripawds fit and trim! PS Monica also has a yahoo group list called K9Kitchen if anyone is interested in getting on it. Very informative and fun show. Thanks for hosting it Jim and Rene. Thumbs up to Bart, Darcy and Dr. Huggins. I had a tear in my eye listening to Darcy describe the hunters reaction to 3 legged Bart during the trials. What an inspiration they both are. I just listened to the show again as I missed some of it try to get it loaded up. With tears in my eyes as I type this just as Brett said, listening to Darcy talk of the hunt judges with tears in their eyes, Darcy & Bart, you guys ROCK and are showing the world that “can do” attitude! Keep up the GREAT work! Enjoyed the talk thoroughly! It was so great to share the information and I am so glad Dr. Huggins was there to provide the vet's perspective on diagnosis through care. She is an amazing person and Bart & I are so blessed to have her on TeamBarty!! Dr. Huggins mentioned Glucosamine/Chondroitin, which Bart has also been on since 2008. We buy the human kind and get as much of the glucosamine dosage possible. I am glad she remembered that component! I can't wait to dig deeper into others' blogs and see what treatment, diet & supplement regimens they have found, too. Again, Thanks Jim & Rene for doing this. What a great niche to help folks out! Thanks again Darcy! Your future forum posts will not require moderation.